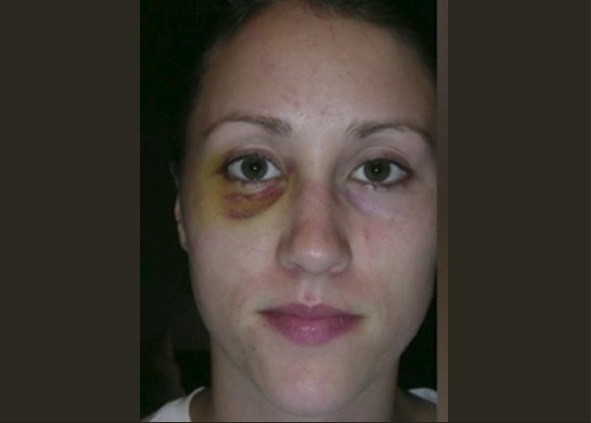 When I saw the image furiously circulating on the internet of former White House staff secretary Rob Porter’s ex-wife Colbie Holderness’ black eye she says resulted from Porter hitting her, I got angry and then sick. Domestic violence needs to be part of the #metoo conversation. Unfortunately, there are immature, out-of-control, disturbed, and angry people committing violence against their domestic partner. I’m somewhat ashamed to say, I was in two back-to-back abusive relationships for far too long. Not only did remaining in these toxic situations tax me emotionally and physically, they cost me a job and also sent me tumbling down an economic hole toward poverty. A tense, ugly relationship with many blood-red flags that couldn’t have been more obvious; the violence in the first of these relationships culminated after a particularly brutal argument. This man, twice my weight and height, grabbed me; smashed my head into a bathroom tile; dragged me across the floor; down some stairs; and tried to smother me with a pillow. He didn’t let up until I was just beginning to black out. After I finally woke up and left, I headed straight into another poisonous adventure with an alcoholic who got violent when drunk. Life with such an individual is, unsurprisingly, extremely detrimental to work performance. I was in a job I had been successful at for half a decade and I became so emotionally drained, anxious, and so fraught with rage that issues that I would have handled well otherwise, I handled terribly and was given the pink slip. Having broken up with the alcoholic—who did contribute financially to the household, with no job, and not much freelance work to be had; the bills piled up. I was threatened with eviction. My credit was nearing a negative number. Domestic violence didn’t just leave me emotionally and physically battered. My career and my finances were wrecked. Also, the Corporate Alliance to End Partner Violence found that 64% of women said their work was affected by their abuse. They cited feeling distracted and a loss in work productivity as well as missed days—all as consequences of partner violence. And African American women are victimized by domestic partners at a 35% higher rate than white women. Black women are also more likely to be killed by a partner. As black women, we are used to striving; after all, we are making gains in the workplace and are among the most educated demographic in the country. “We got this,” is a phrase we love to use to self-motivate ourselves and our sisters. But, when it comes to a domestic violence situation and not ending the abuse as soon as possible: Girl, you don’t got this. If you are in the same situation that I was, get out, get assistance, and reclaim your life. I finally did and emerged stronger in my profession, my finances, and as a person. The post Domestic Violence Is a Workplace and Economic Issue [Opinion] appeared first on Black Enterprise.